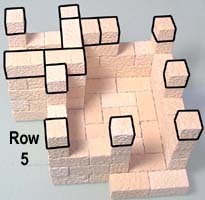 Steps for using mold #50 to create the model shown here. 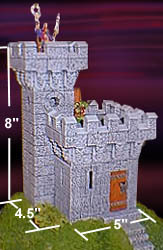 The Wizard's Tower model is one of the easiest to build. 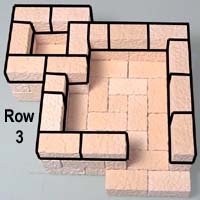 If you are a beginner, I would suggest starting with this model before moving onto some of the more difficult buildings on this web site. 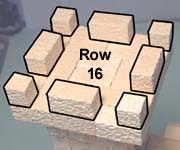 The Wizard's Tower mold (#50) has a lot of basic building blocks, which you will need on most any project you want to make. 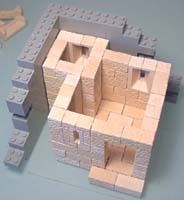 Once you complete this project, you may notice that you had not used any of the 3/4" long blocks to build this tower. 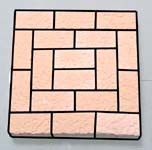 The 3/4" block is a later addition to this mold, and it is very useful if you want a round topped window that is square on the bottom. 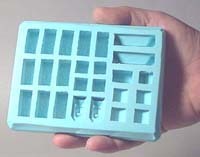 A Note For Parents With School Projects We only sell rubber molds! (as shown on the left). 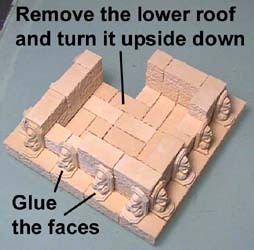 The blocks shown in the instructions below are cast using the mold we send you. 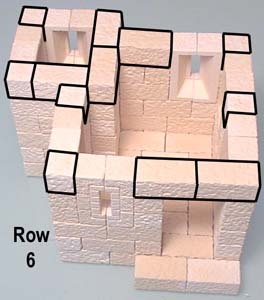 You will not receive building blocks in the mail, but the means to cast your own building blocks out of plaster. 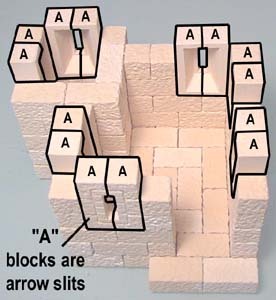 For a quick introduction about block casting, visit our Quick guide for the beginner page. 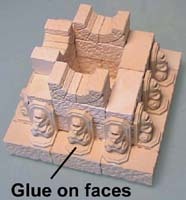 For complete instructions on casting and painting, look at the bottom of our Home page. 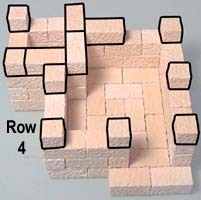 You will need to cast mold #50 (the Wizard's Tower mold) 18 times to have enough blocks to build the tower. 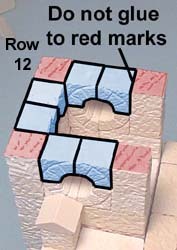 For complete instructions on pouring the blocks, see the Casting Instructions page. 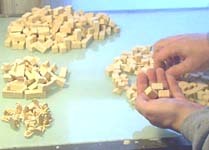 The blocks should be completely dry before gluing them together. 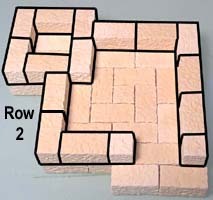 If they feel cool or look darker than the other blocks, they're still wet. 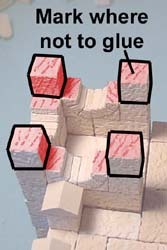 I'll be using Aleene's Tacky Glue, but you can also use Elmer's Wood Glue. 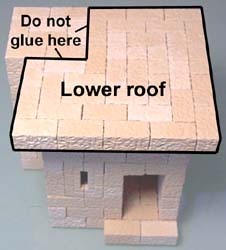 For complete instructions on drying blocks and types of glue, check out the Building Instructions Page. 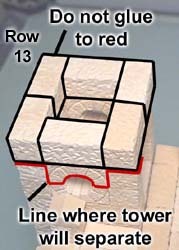 You print out the plans for this tower from the Building Plans Page, or you can simply follow the instructions shown here. 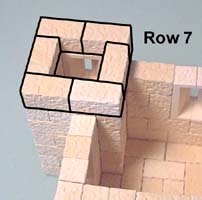 Glue the arrow slit blocks into the gaps that we left in the previous rows. 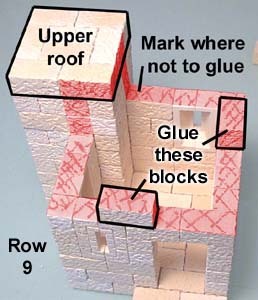 Be sure the bevel side is facing inside the building. 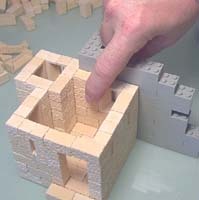 Here I'm using Legos formed in a right angle wall to push against the tower. 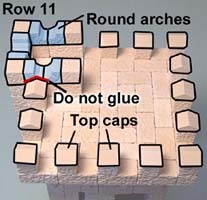 If you do this for each row as you glue it down, your tower will stay straight all the way up. 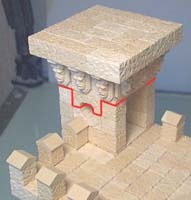 Take a marker and draw lines on the area shown in the right photo. 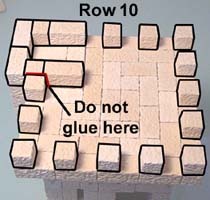 These marks will be a reminder to you where not to glue when putting on the next few rows of blocks. Let it dry completely before you move on. 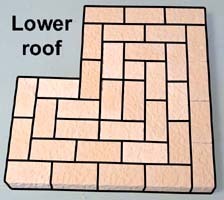 Once dry, remove the lower roof and turn it upside down. 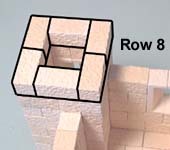 The 2 rows of blocks below should stick to it. 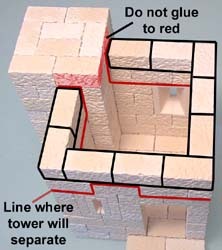 Take a marker and draw lines on the area shown. 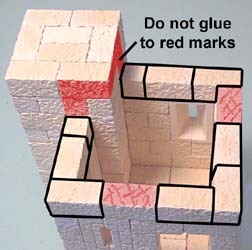 These marks will be a reminder to you where not to glue. 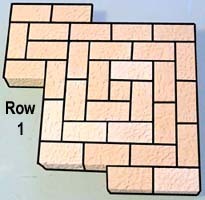 Finish the tower by gluing on the last two rows. 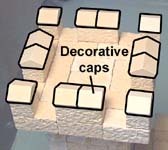 The final row is made of the decorative top caps. The completed model is shown here with a few finishing touches such as doors, grass, bushes and terrain. 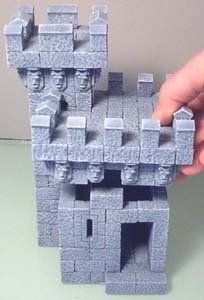 The base for this model was carved from a block of blue foam. 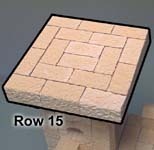 Ground cover was added using railroad scenic materials. The doors were made from mattboard. Keep in mind that you can build any design you want! Make it twice as large, or with additional towers. The possibilities are endless!